Generic Host Process is a Windows service necessary for networking. Many applications use this process for communication. It is not recommended to delete this file or block it access to the internet. Usually it runs without problems, but recently, the problem with Generic Host Service for win32 occurs quite often due to virus and rootkit activities. 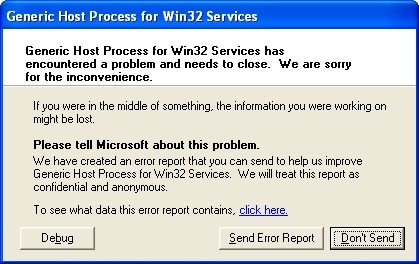 If you found this page, it is likely that you got an error message like “Generic Host Process for Win32 Services has encountered a problem and needs to close. We are sorry for the inconvenience.” If you also look for the article “How to fix svchost.exe (LocalSystemNetworkRestricted) error“, you can read it on this website. These problems clearly indicate that there is problem with the svchost.exe system process possibly caused by the malware activity and this is the first of causes that need to be addressed. Not any antivirus will respond for the possible cause, and there is no any reliable way to easily determine is the problem caused by the malware or by some system problem such as faulty driver or a driver incompatible with the network software. So, there is only a one reliable way to catch the problem by chance while performing some trial sequences of different operations on your PC related to the problem. The first one is running of a full scan on your system with advanced antivirus with up-to-date virus signature bases. It will not necessarily identify the possible problem, but the chance to fix the problem quick and to avoid other operations well worth it. The known viruses that might cause the problem with Generic host process for win32 are quite advanced and include net-worm.win32.kido.ih, conficker, Heur.Worm.Generic, Backdoor.Win32.IRCBot.idc, or Troj/IRCBot-XJ Trojan. You might have one of other numerous worms, viruses and Trojans that pretend to be a legal svchost.exe or use legal svchost.exe to run at windows startup. There is no assurance that a new more advanced version of this malware wouldn’t find the way to fool antivirus software, and there is no guaranty that the antivirus that identified the problem will successfully remove it. If this is the case, than you might need a special removal utilities related to the virus version or to the problem with Generic Host Process for Win32 error. One of the advanced helpful tools for the removal of viruses end other malware is Combofix that is a free program. There is a special solution PC Health Advisor related to the Generic Host Process for win32 error that you can download on this page and use for fixing your system from the problems left after the virus removal, faulty drivers and other possible causes of the svchost.exe malfunctions. The problem with Generic Host Process for win32 error might be related to failures not related to virus activities or related to the problems that weren’t resolved after the malware removal. Here you need to run tests on different system components, and try to fix it in the most reasonable way. Try to resolve these problems with the System Restore to the most recent previous state saved. If it doesn’t help, try to start your system in Safe Mode and see if the error will disappear. The problem might be caused by the network adapters and their drivers. To test this one, Open Control Panel and click Device Manager and expand the branch Network Adapters. The problem might be shown there and then you will need to download new drivers from the internet. You also can try to test your files for corruptions with CMD sfc/scannow. It will work with Windows Vista and 7. For the run on Windows XP you will need the installation CD. You also can run msconfig – in the open window open Services tab and put mark the check box “hide all Microsoft services” Then press the button Deselect all services. If the problem resists, than it is not related to the service. If it is gone, then try to turn services on one by one in attempt to find out which one service causes the problem. There might be other even more complex problems as well, and it is not possible to address all the possibilities in one article. Even more difficult to perform all the possible tests and procedures by hand, without any help in the process. The only way to avoid all this trouble or to get professional support in the most problematic cases is the use of the special software that is able to automate the process and condense it in a few clicks on the user side. But if you don’t want to waste your time on following the above instructions step-by-step all you need to do is download Regcure Pro. This tool is specifically designed to fix svhost.exe problem like “Generic host process for win32 services” error saving your time and efforts. Thanks, this really helpful. Finally, got my old Windows XP to work properly. Really great source of technical info! Subscribed!